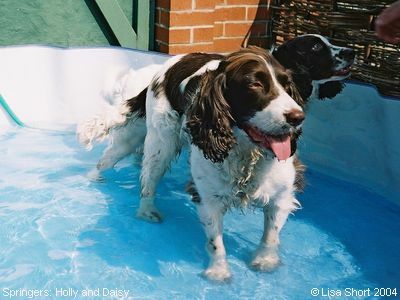 Holly and Daisy have their very own paddling pool! Both of them are obviously 'water dogs', and love to splash around in the hot weather! Daisy thinks it's just the biggest drinking bowl ever! Daisy is the smaller one at the back, and is aged 6; Holly is aged 7, but was adopted from next door when she was aged 2. They get on so well together, and do not like to be apart, nor separated from their owner, who takes them everywhere with her! Training them, she says, has been easy, as they copy each other, so if one sits, the other follows!